Australia played a significant part in World War II, with troops serving mainly in North Africa and the Mediterranean during the early stages. Once Japan entered the war their emphasis shifted, and most forces were committed to homeland defence and operations in South-East Asia. 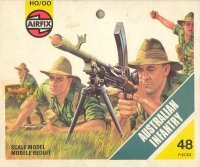 Several manufacturers have depicted these outstanding soldiers in 1/72 plastic, including this fine set from Airfix, which appeared at the same time, and with many of the same poses, as the 1/32 version. During their service in Europe and Africa, Australian troops wore uniforms closely resembling those of the British. However these figures are clearly dressed for the campaigns in Asia and the Pacific. All wear the slouch or 'wide awake' hat, which is of course their most distinctive feature and a much-loved symbol for the men themselves. This was almost always worn with the brim down, but one figure here has the brim pinned up on the right side. When they were pinned up, it was the left side that was attached to the crown, so this man has perhaps rigged something so he can more easily carry items on his right shoulder (and of course this way it is easier to sculpt the box he carries). Steel helmets were widely issued but not often worn in the jungle, so their absence here, even just attached to the webbing, is understandable. As the slouch hat has expensive and could get snared by vegetation a beret-type headwear was also issued and often worn, but this frankly ugly item has not been reproduced on these figures, Instead they all have the slouch hat, which if not as universal as this set implies, is certainly enough to make them obviously Australian. Early service in the hot and wet terrains of South-East Asia showed the inadequacies of the uniforms worn at the time. Clothing rotted and was eaten by everything from moths to rats, so gradually more suitable clothing was developed. All these men wear the same thing, which is a shirt and long trousers with long gaiters on the lower leg (probably US issue). In reality clothing was much more varied than this, and of course was often in very poor condition, so we would have expected men wearing shorts, bare-chested and so on, but everyone here is relatively neat and consistent. They wear British '37 webbing, which was less common by this time, and again we would have liked to have seen more variety in belts etc., so while nothing here is wrong it does not give a particularly true reflection of the appearance of these troops much of the time. Six of the poses carry rifles, and two are using a Bren gun. Two more carry a Thompson submachine gun, but interestingly this is the M1928 version with the fore pistol grip, which certainly was used in this theatre by these troops, though the later model could also have been included here. Equally missing but a nice-to-have would be the Owen submachine gun, but many here are lucky enough to have a machete. Three of the poses are unarmed, and all are quite lightly kitted, with generally no more than the bayonet scabbard, machete and a water canteen. The poses include the usual staples for World War II sets, but they have been done well. The man carrying a box on his shoulder helps to remind us that a lot of time was spent in mundane marches, since motor and even quadruped means of moving supplies was often impossible or not available. The casualty sitting on the ground is another interesting and unusual figure as he has his right leg in a splint. The man using his rifle as a club would not have been able to swing it properly as he is holding it half way down the barrel, and we are dubious about the value of such a pose in a twentieth century subject anyway, though of course hand-to-hand fighting certainly did take place during these campaigns. The officer is waving a machete and also has his revolver drawn, but is correctly dressed like his men. However with enemy snipers always a threat, officers generally went out of their way to hide their rank, so even having a visible pistol holster was often avoided as an unnecessary risk. This man however seems to have no such concerns, and at least makes it easy for us to see that he is in charge. All the poses are beautifully done with a lot of life, and apart from the guy 'clubbing' they meet with our full approval! All the figures are beautifully sculpted with great proportions and a high degree of anatomical realism. The prone man firing the Bren gun has been moulded from the sides, which means the bipod that supports the gun is solid, which is an unavoidable compromise on an otherwise very good pose. Also the crawling man has very hunched shoulders, which is necessary to allow the hat to touch his back and avoid excess plastic, but it looks a little odd. Apart from these points our only problem with this set is how surprisingly short the figures are. The traditional thickness of the Airfix base goes some way to hide the fact that these men are very short indeed - noticeably shorter even than the Matchbox set, which is done in HO (1/87th) scale! Flash is highly variable, as is only to be expected on a set that has been made and remade so many times over the years. We have seen whole sets with no flash at all, and others with a lot, so basically almost any level is possible. Leaving their diminutive size aside, this is an example of some extremely nice sculpting, and in any event the thick bases mean they can comfortably stand alongside figures from other manufacturers. With well-defined detail (especially on the weapons) that was the trademark of later Airfix sets, this is a great collection of figures that may not have the grimy and disparate look of the real thing in action, but remains a favourite for many and rightly so.